The title of this website has no surname, because the focus is not only on my family name, or my wife's, but also friends and family for which I and others have spent time researching. Each surname combination has a separate section with lineage, photos, and links. There is much to add to each section, so be patient. If you found this page by entering a name into a search engine like Google, you might check "Jimsweb's Most Wanted" at the end of this page to see if the match is there. The Heatons and Haynes are my mother's side of the family. She gets top billing, because she saved all the family history and pictures. 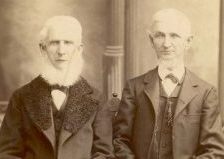 The picture at left is of Samuel Heaton (right), my great-great grandfather, and his brother Andrew taken about 1885 in Iowa, where both were farmers. 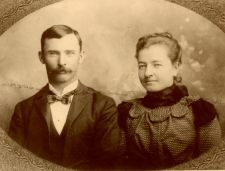 Samuel's descendants also included his granddaughter Nelle Heaton who married Roy Newfarmer, establishing the link to the Newfarmer-Pace-Farris lines. While we're on the subject of Newfarmer-Pace-Farris, Shirley Pace Newfarmer has also preserved her family history and kindly shared it with me. Her grandfather, Charles Wesley Pace, Sr. married Elizabeth Jane Farris, which opened the way to my research into that very interesting family. The picture at left is of Shirley's father, Charles Wesley Pace, Jr. and his wife Anna Humphrey, taken about 1897. Ella Quinlan, youngest daughter of Richard Jackson Quinlan and Lucy Orvis, married Joseph Heaton, the two being the parents of eight Heaton children, including my grandfather Roy, and Nelle who married Roy Newfarmer. 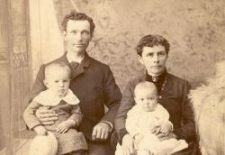 The picture at left is of Joseph and Ella and their first two children, Harry and Edna, taken about 1880. Ella Quinlan's mother, Lucy Orvis is a descendant of the early American families, Parker and Orvis, so much is known of them. And, one of our genuine family mysteries is the fate of Richard Jackson Quinlan. The Pearces and Elliotts are my father's side of the family. The Pearces are a well documented line who migrated from Virginia to Alabama and finally settled in the bayou country of Louisiana. My grandpa Gus was a railroad man who found his way to Carbondale, Illinois where he met and married Alma Elliott. 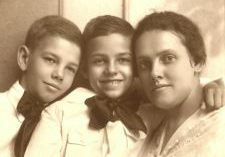 The picture at left is of Alma and her two sons, William Elliott Pearce (my father) and James Allen Pearce, taken about 1918. On my wife's (former Marilyn Kay Lincoln) side of the family are the "West Coast Lincolns." 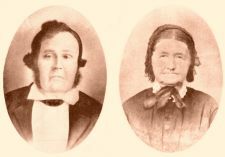 Nathan and Phebe Lincoln (picture about 1860) and their family migrated from upstate New York down the Allegheny and Ohio Rivers on a flatboat in about 1830, and settled in Southern Illinois. From about 1850 - 1870 most of Nathan's children and their families went west to California and Washington over the pioneer trails and settled in the Napa, California and Seattle, Washington areas. Parents Nathan and Phebe followed in about 1859 via the Panama route. The other side of my wife's ancestry is Wheeler-Gran. Through the Wheelers, she traces her ancestry to both Edward Doty and William White of the Mayflower. 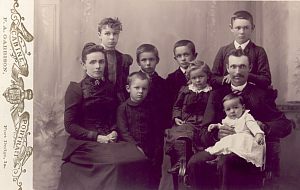 The Grans emmigrated from Norway to Minnesota in about 1850. 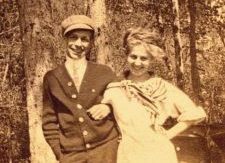 My wife's grandparents, E. Ford Wheeler and Olga Gran, pictured at left in about 1913 , met while attending the University of Washington in Seattle. I also do the family history of my mother's husband, Harold (Chris) Christie, USN Ret. His ancestry includes the Christie, Smith, Small and Allen lines, and the Ankenbauers of Iowa, with whom Chris spent his childhood. At left is Chris' grandfather Edward Christie and his wife Elizabeth Lucinda Smith, about 1900. And lastly, my friends Gordy (Gordon Wesley Fuller) and his wife Cheri (Mary Sue Adams) and their families. Cheri has the family history and photos, and together we're tracking down the ancestors. 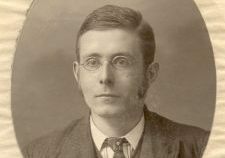 The photo is of Arthur Reginald Butler (about 1910), Cheri's great-grandfather, who was the Chief Medical Officer of the U.S. Civil Service Commission. This section is a listing of the individuals or families about which living relatives would like to locate more information. The list is here on the home page because it appears Internet search engines like Google are only indexing our home page. So, anyone searching the Web for names listed deeper in the website would not find us. Hopefully, this will solve the problem. Click on the highlighted name for more information on the individuals listed. Mary Dunbar(Mary Polly Dunbar Farris) (1815-1886), Joel Charles (1753-1843), Jemima Charles (abt. 1795- aft. 1833). Richard Quinlan (1823-), Thomas Quinlan (1788-1850), Mariah Quinlan (1800-1846), Lucy Orvis (1825-1907). FOUND - Henry Newfarmer (1825-), aka Henrich Neubauer, see Newfarmer Notes in the Newfarmer-Pace-Farris section. Elijah Hickman (abt 1840-1875), m. Emily Jane Dolbow, son William Hickman. FOUND - Ogden Squires (abt 1832-1880), dau. Harriet (Hattie) Ogden Squires. FOUND - Phyllis Ann Welborn (1924-1971), m. Kenneth L. Mobley, Charles Mortus; dau. Darlene. FOUND - Winifred F. Clayton (1882-1907), dau. of William A. Clayton and Sarah Emily Farris, sister of Anna Edna Clayton.